I do believe that going to Steak Night at L’atelier des Chefs was one of the most important things I have done this year. I can now confidently cook a steak and know it’s going to be delicious and perfectly cooked. Plus, I’m sure I’ve racked up some brownie points in the kitchen. 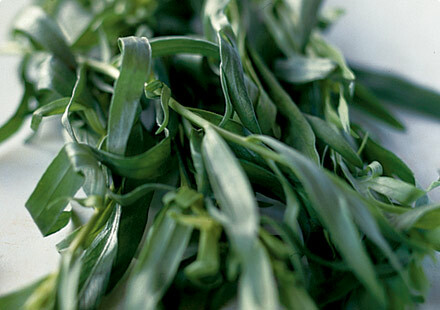 Did you know this was what fresh Tarragon looked like? I chop ‘backwards’. Apparently the more effective way of chopping is to bring the knife from tip to heel onto your ingredients. Ceramic knives don’t need sharpening. Why do we not all have these in our kitchens?! Cutting things like spring onions at a 45’ angle looks nicer than cutting it at a 90’ angle. In professional kitchens, you often have a sink for washing hands that you can turn on by butting it with your hip. When chopping chillies, use a spoon to scrape out the seeds. And make sure you cut it fleshy side up. If you’re going to use your knife to transport bits of food you’ve chopped elsewhere, use the back (I also think of it as the top of the knife, if the bottom bit is the sharp side) of the blade to scrape it up with otherwise you damage the sharp side. Fresh tarragon smells like Sambuca. Sorry, licquorice. You can never have enough good olive oil in a salad. Use cooking olive oil as opposed to Extra Virgin Olive Oil when searing the steak. Cooking steak is not all about frying – you actually place the steak into the oven for a couple of minutes. Who knew this?!! If you’ve got low grade meat, it’s never going to taste great. L’atelier get theirs from Allens of Mayfair. Don’t try putting your steak in the oven if your frying pan has a plastic handle – get one with a metal handle and don’t burn yourself. For a good crumble topping, use butter that is straight out the fridge and don’t squish it too much as it can easily turn into a dough. 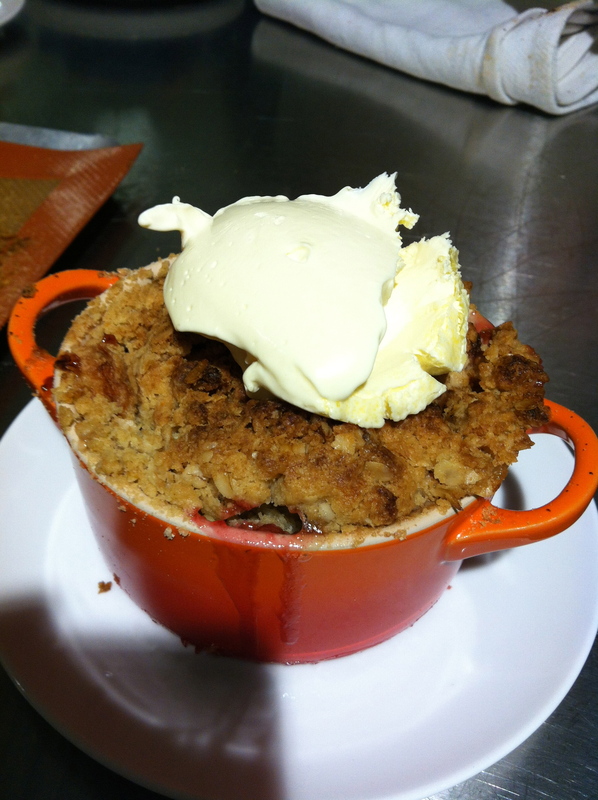 For apple crumble, use apples with more heat-resisting flesh. For example, cooking apples or Bramley apples. Apples such as Pink Lady will just turn into mush. Serve your crumbles in mini Le Creuset pots – this is guaranteed to make them taste at least 15% better. L’atelier des Chefs are doing an amazing deal for 4 for the price of 3. And you can also use them for other stuff like macaroni cheese. 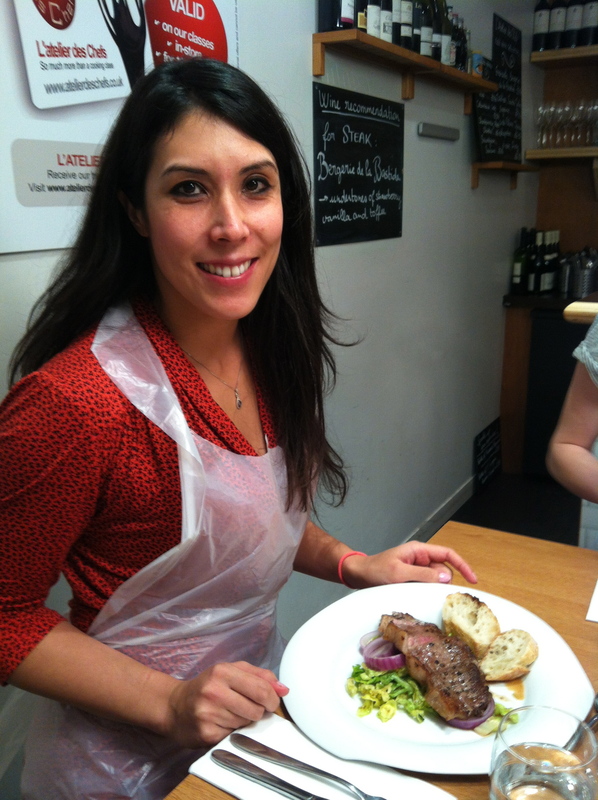 For something different and unique, L’atelier des Chefs do a wide range of cooking classes at their Oxford Street and St Paul’s locations – from 30 minute ‘Cook, Eat and Run’ lunchtime cooking classes, sushi lessons, knife skills classes to making your own macaroons. If you want to impress this Christmas, why not take one of their Christmas classes? A lot of people seem to get these lessons for others. I say STUFF THAT, go and do it just for yourself.